New York – The temperature is rising, the storylines leading up to the final Grand Slam event of the year are multi-faceted, and the compelling third season of the US Open Series is about to begin. A fantastic summer road trip, the six-week, 10-tournament North American hard court season culminates at the US Open in late August. Interest in the US Open Series has never been higher, as 200 top players prepare to compete for valuable US Open Series Lever 2000 Challenge points, with bonus prize money and fame on the line. 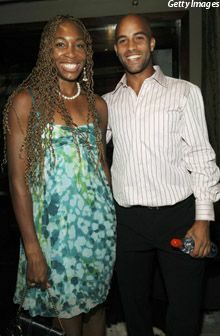 Less than a week before Week 1 of the Series with the start of the RCA Championships, two of the biggest tennis stars on the planet, James Blake and Venus Williams, had a whirlwind day in New York, making national television appearances on the Today Show, Regis & Kelly, CNN Headline News, and ESPN’s Pardon the Interruption. Capping the tour, both attended the US Open Series kick-off party at the trendy downtown Manhattan club, The Manor. Along with showcasing the new US Open Series trophy, two new 30-second US Open Series television ads featuring Blake and Williams were played to the capacity crowd. In between the busy media circuit, Blake, who attended high school and is a resident of nearby Fairfield, Connecticut, made the quick road trip north of the border to host a free tennis clinic at Scalzi Park in Stamford, followed by a J-Block Party on The Green in New Haven, home to the US Open Series’ final event before the US Open, Pilot Pen Tennis. Kids from the New Haven Park & Recreation Summer Camp attended the free tennis clinic at the beautifully-renovated Stamford public court. The raucous J-Block, a grass-roots rooting section of many of Blake’s childhood friends and family, sprung to life last August at Pilot Pen and exploded at the US Open. This year, in conjunction with Nike, all proceeds from specially-produced J-Block t-shirts will donated to the USTA Tennis & Education Foundation. Bolstered by his breakthrough win last year in New Haven, Blake enjoyed a dream run at the US Open, culminating with his past-midnight quarterfinal epic against legendary superstar Andre Agassi. A year after gaining admittance into Wimbledon as a wild card entrant, Blake returned from England as the top-ranked American (No. 6 in the world) for the first time in his career. Continuing to build on his inspirational 2005 season, Blake is considered one of the big favorites to win overall US Open Series honors. Blake is entered in next week’s RCA Championships, along with 2005 US Open Series overall winner Andy Roddick and defending Indianapolis champion Robby Ginepri. “It’s going to be a great summer starting at Indianapolis for the Americans,” said Blake. “Last year we had an all-American final and I hope we can do it again this year.” In 2005, Ginepri defeated Taylor Dent in three sets after Dent was forced to retire down 0-3 in the third set. En route to Los Angeles for the 2006 ESPY Awards (Sunday, July 16 at 9 pm eastern on ESPN), Blake has been nominated in the “Best Game” (Agassi vs. Blake at the 2005 US Open), “Best Comeback,” and “Best Male Tennis Player” categories. Williams is up for “Best Championship Performance” for winning Wimbledon and in the “Best Female Tennis Player” category.